Tax season has finally come and gone, and by now most Americans have either gotten their refund or established a payment plan for taxes owed to the government. Here’s a nice thought experiment: go back and look at your tax return to figure out how much money the government claims through all forms of taxation. How does your own situation compare to the rest of the world? The Organization for Economic Co-operation and Development (OECD) tracks both the average wage earnings and taxation figures for each of its 35-member countries. Gross earnings refer to the amount of money you get paid before anything gets taken out, like taxes, health insurance and retirement contributions. The remainder is referred to as net earnings. We used these numbers to create a pie chart. The overall size of each slice refers to the level of gross earnings, and the green portion represents net income after taxes. We illustrate the difference between these two figures with dark red referring to income tax rates, and pink referring to social security taxes. The result is a snapshot of how much workers actually take home across the OECD. Our chart reveals a few different dynamics in the OECD. First off, Switzerland stands out atop the rankings with $70,835 in gross and $58,864 in net take home pay. The combination of high earnings with low taxation is hard to beat. Now take a look at South Korea. The country ranks way down in 14th place in terms of gross earnings ($52,505) but rises to 4th in terms of net earnings ($44,892). That’s entirely thanks to a relatively light tax regime of 14.5%, which is the third lowest rate in the OECD behind only Chile (7.0%) and Mexico (11.2%). At the other end of the spectrum, some countries have extraordinarily high taxation levels that take up significant chunks of workers’ paychecks. 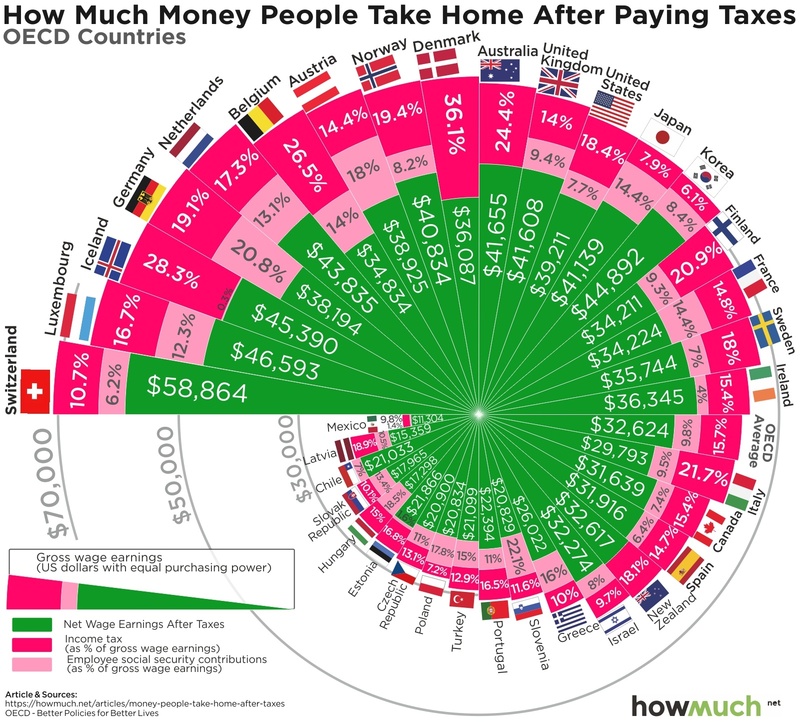 Belgium is the clear outlier in this regard with $58,545 in gross but only $34,834 in net take home pay. This is thanks to an average total tax rate of 40.5%, pushing it below Ireland and France. Another interesting trend in our visualization is how many OECD countries are scrunched at the low end. Mexico, Latvia and Chile are so small that the slices are almost difficult to distinguish. In fact, the average gross earnings across the entire OECD is only $43,792 with net earnings amounting to just $32,624. This means that Americans are above average in terms of their earnings, but not dramatically so. The potential to make an obscene amount of wealth is likely higher in the U.S. than any other country, but not for most people. There are two important caveats to keep in mind. First, federal income taxes can be highly complex, and as much as 45% of taxpayers don’t pay any federal income tax whatsoever. Second, despite all the focus on take home pay, it is worth remembering that income taxes and social security taxes both eventually buy workers something—namely, everything that the government spends money on. Many people across the OECD take the long view that paying for social services through taxation makes a lot of sense for society. All that being said, more take home pay on par with Switzerland wouldn’t be too bad either.